Burgers on wooden board rotating. Dark and light buns. Tastiest hamburgers at special price. 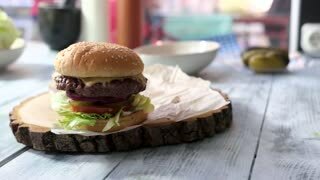 Burger on a wooden board. Meat and sesame bun. Burger on a wood board. Sesame bun and meat. Simplest recipe of a hamburger. 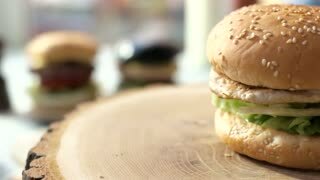 Three hamburgers on wooden background. 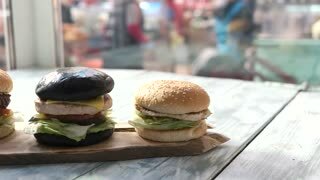 Dark and light burgers. Burger on wooden board. Hamburger on gray table. Eat daily norm of calories. 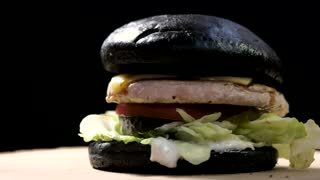 Burger with black bun. Hamburger on dark background rotating. Top view of rotating burger. 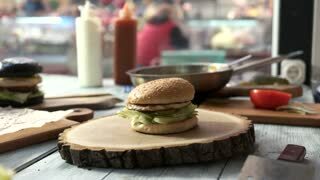 Hamburger on a wood board. 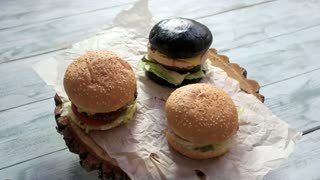 Three burgers on wooden background. Hamburgers with sesame buns. Tasty food at lowest price. Different burgers on the table. Hamburgers and wooden boards. New fast food joint. Burger on wood board rotating. Cheeseburger with sesame bun. Cuisine of usa. 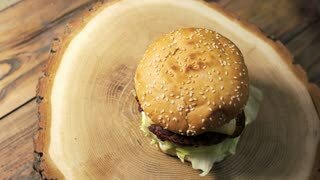 Burger on wooden board. 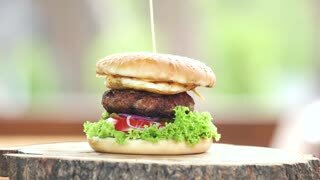 Delicious beef burger with egg.